This mob spawns at -82, 118, -36. This would be in the light blue region on the downloaded maps.. This page last modified 2019-01-14 06:22:12. Location is -82, 118, -36. This would be in the light blue region on the downloaded maps. [Sat Aug 15 10:55:56 2015] Your faction standing with Sabertooths of Blackburrow has been adjusted by -5. [Sat Aug 15 10:55:56 2015] Your faction standing with Guards of Qeynos has been adjusted by 1. [Sat Aug 15 10:55:56 2015] Your faction standing with Silent Fist Clan has been adjusted by 1. [Sat Aug 15 10:55:56 2015] Your faction standing with Jaggedpine Treefolk has been adjusted by 1. [Sat Aug 15 10:55:56 2015] Your faction standing with Merchants of Qeynos has been adjusted by 1. [Sat Aug 15 10:55:56 2015] You receive 9 silver and 5 copper from the corpse. [Sat Aug 15 10:55:56 2015] Vaner hits a gnoll tactician for 58 points of damage. [Sat Aug 15 10:55:56 2015] a gnoll tactician has been slain by Vaner! cons even to yellow to me at lvl 12, so he's not just lvl 15. If you're just going in for the tactician (or just feel like starting there) there's a trapdoor that drops down to the pool he always hangs out at. Just forward and to the left of the entrance is a hollowed-out tree (usually a gnoll pup there). Step into that, and you fall into the Tactitian's pool. 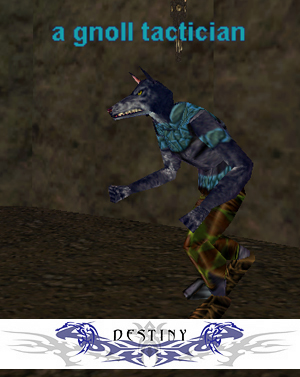 He dropped a blackburrow gnoll skin the other day. The plans the tactician drops are for the final faver in the Stormhealers Armor quest (a nice mace). It's the courior's plans (four of them) that are for the Gnoll Basher. Every time I have killed the Tactician, he is located in the small room with the pond (the one next to the bridge and the ledge). The Tactician always appears to drop the Battle Plans, which can be turned in as part of the quest for the Club of Gnoll Bashing. You're talking about the courier's plans.